The 2013 US Open from Merion was one of the most unique in recent years. What started off as one giant weather delay in which some in the media thought low scores would be abundant finished the way most have in recent years. With even par holding up as the true measure. Heading into Sunday’s final round, the tournament had 8 players right in the thick of things and only one man under par. That man, Phil Mickelson. The same Phil that has been a bridesmaid at the toughest test of golf multiple times and never the bride. Carrying no driver and an extra wedge, the man they call “Lefty” played the course beautifully for 3 rounds and the final round came and went with Mickelson once again coming up a bit short. The story was not just Mickelson however, the story was Justin Rose and his beautiful performance. Justin Rose performed brilliantly throughout and played the course the way it needed to be played, only taking chances when they were for the taking and minimizing risk. Rose recently switched to a new putter, the TaylorMade Spider Blade, and big putt after big putt you could sense a level of comfort that he had with the new flat stick. Here is a look at the tools Justin Rose used to win his 1st major, the 2013 US Open. Great win for Justin and well deserved. I know that TMaG is really excited for him. Superb win for Justn! He came a close second to a brilliant golf course! That Spider Blade was on fire. What a great win for JR, well deserved . Pretty classic bag setup there for Justin. It treated him well and he persevered a very tough golf course to be the last man standing. It drives me crazy when people like Dan Hicks tried to turn this into a Mickelson failure, instead of a Justin Rose victory like it deserved to be. Justin Rose blistered the drive of his career on 18, and rifled a 5 iron closer than anyone that day, he won that tournament. Mickelson was collectively 2 inches away from making 6 putts that would have won him the tournament by a couple strokes. He did not choke. Dan Hicks drives me absolutely nuts, he almost sounded giddy to call that finish as a Mickelson failure, and didn’t give nearly enough credit to Rose. 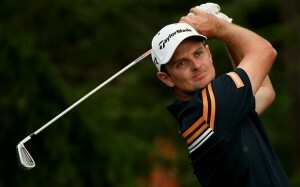 Great to see another 1st time major winner in Justin Rose just like it was for Adam Scott at this years US Masters. I felt for Phil, but ultimately he couldn’t just get the putts to drop on Sunday. Another tough US Open for the players!